Welcome to Moore Speed Racing! 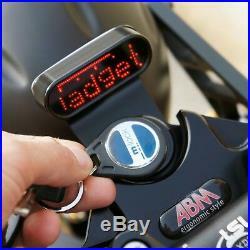 Motogadget M-Lock RFID Ignition Lock Motorcycle custom 4002000 keyless ignition. 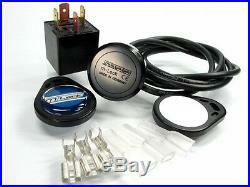 Motogadget M-Lock (RFID Ignition Lock). The m-Lock is a contact free digital ignition lock with RFID technology and substitutes mechanical ignition locks or their electrical switching feature respectively. The associated digital key/transponder only has to be approached to the m-Lock switching distance approx. 40-50 mm and the ignition is switched on or off completely contact free. The m-Lock is based on the latest RFID technology (Radio Frequency Identification) and therefore, unlike e. Each key/transponder has a unique digital code. The m-Lock can be actuated with the correct digital code only. Key/transponder and m-Lock are absolutely free of mechanical wear. The m-Lock switches automotive relays with a possible load of up to 40A - sufficient power for every on-board system. The hidden mounting of the small m-Lock, covered by non-metallic parts like e. A plastic side panel, permits completely removing the mechanic ignition lock. Clean look and various design possibilities are guaranteed - especially for custom bikes! The available option'Glass Tube' is so small (3 x 13 mm) that it can be sewn into the glove. Please note the reduced switching distance (about 5-10 mm) of the Glass Tube transponder. The 2 included standard keys (teardrop shape) are key fob sized. 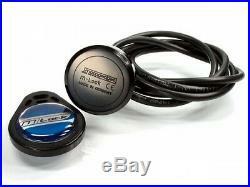 All keys/transponders are available as a replacement'key blank' and can be'taught' to the desired m-Lock. NOTE: We do not recommend using the m-Lock combined with immobilizers! Transmitter/receiver, diameter of installed assembly: 30 mm. Fixture: 2 x M3 threaded hole on back side. Operating voltage: 6V - 18V. 1 user key and 1 master key (teardrop shape). 4 flat pins with isolating sleeves. Detailed installation and operating instructions. Based in between Poole, Dorset, we supply a wide range of performance parts for all styles of motorcycles from the simple bolt on items to race spec performance parts. Not only do we offer the best service and prices, you can also profit from our down-to-earth'tell it how it is' philosophy. Not just parts and accessories for your motorcycle, we stock a large range of clothing, helmets, gloves and boots! We are Dorset's one stop shop! Thanks to our large workshop, featuring 3 fully trained and qualified technicians we are able to serivce, MOT, modify, fault find and repair your motorcycle(s). On top of that, we have a Dynojet dynometer, allowing us to compile a full custom fuel map on your machine, power runs, fault finding etc! You can be sure that if you are thinking of doing it, then one of us will have probably tried it! We have a wide range of products from the leading brands in all fields of motorcycle parts including: Rizoma, Akrapovic, Yoshimura, Motogadget, Biltwell, Remus, Rentec, Givi, Powerbronze, Powercommander, Renthal R&G, Shark, Bandit & Richa, to name a few.. We are also a stockist and retailer of genuine Indian Motorcycle's, parts and accessories as well as Victory Motorcycle parts. Bournemouth Motorcycles division For Quality New & Pre-Owned and Custom Motorcycles for sale, Servicing, Tuning and Customising look no further than Bournemouth Motorcycles of Poole in Dorset, with over 60 motorcycles in stock at any one time! Powered by Moore Speed Racing the South coasts premiere motorcycle parts, performance mods, workshop and clothing retailer. Bournemouth Motorcycles is Dorsets newest supplier of used and brand new one off custom motorcycles. All items on our store are delivered to anywhere in the mainland UK for the advertised price. For UK deliveries we use the following services. Buyers are welcome to collect their items from our superstore in Poole, Dorset. Monday to Friday - 8:30am - 5:30pm. Saturdays - 8:30am - 1:00pm. Without this, your item cannot be traced. Units 11, 12, 14 Cortry Close. Monday: 8.30AM - 5.30PM. Tuesday: 8.30AM - 5.30PM. Wednesday: 8.30AM - 5.30PM. Thursday: 8.30AM - 5.30PM. Friday: 8.30AM - 5.30PM. Saturday: 8.30AM - 1.00PM. Safe & Secure Payments by. Subscribe to our newsletter for latest products, promotions and updates. The item "Motogadget M-Lock RFID Ignition Lock Motorcycle custom 4002000 keyless ignition" is in sale since Monday, January 23, 2017. This item is in the category "Vehicle Parts & Accessories\Motorcycle Parts\Electrical & Ignition Parts\Other Electrical & Ignition". 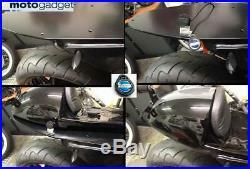 The seller is "moore-speed-racing" and is located in BRANKSOME BUSINESS CENTRE, Dorset. This item can be shipped to United Kingdom, Antigua and barbuda, Austria, Belgium, Bulgaria, Croatia, Cyprus, Czech republic, Denmark, Estonia, Finland, France, Germany, Greece, Hungary, Ireland, Italy, Latvia, Lithuania, Luxembourg, Malta, Netherlands, Poland, Portugal, Romania, Slovakia, Slovenia, Spain, Sweden, Australia, United States, Canada, Brazil, Japan, New Zealand, Israel, Hong Kong, Norway, Indonesia, Malaysia, Mexico, Singapore, South Korea, Switzerland, Taiwan, Thailand, Bangladesh, Belize, Bermuda, Bolivia, Barbados, Brunei darussalam, Cayman islands, Dominica, Ecuador, Egypt, Guernsey, Gibraltar, Guadeloupe, Grenada, French guiana, Iceland, Jersey, Jordan, Cambodia, Saint kitts and nevis, Saint lucia, Liechtenstein, Sri lanka, Macao, Monaco, Maldives, Montserrat, Martinique, Nicaragua, Oman, Pakistan, Peru, Paraguay, Reunion, Turks and caicos islands, Aruba, Saudi arabia, South africa, United arab emirates, Ukraine, Chile.